An International Award – thanks to the support & good wishes from ALL of you! Coinciding with the launch of the blog, I am delighted to share some great news with all of you! I have won an international award, which has been established this year and I am a proud “first winner”. A huge big thanks to all of you on behalf of my QMed Team (this award is as much theirs for all their behind the scenes work) and from me. The International Clinical Librarian Conference Organising Committee are proud to announce that Ms. Vasumathi Sriganesh is the winner of the International Clinical Librarian Conference Evidence into Practice Award for 2013. The International Clinical Librarian Conference Evidence into Practice Award was established this year, to honour a practising librarian or informationist who has made outstanding contributions to bringing evidence into practice in the field of healthcare. The award will coincide with the meeting, “One Health: Information in an Interdependent World”. One Health is an international meeting incorporating MLA ’13 and the 11th International Congress on Medical Librarianship (ICML), the 7th International Conference of Animal Health Information Specialists (ICAHIS), and the 6th International Clinical Librarian Conference (ICLC). The recipient of the International Clinical Librarian Conference Evidence into Practice Award will receive a certificate at One Health and a cash award of $500 after the meeting. The cash award is kindly sponsored by Dynamed. 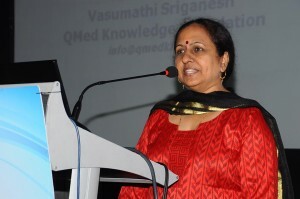 Ms. Vasumathi Sriganesh worked as a hospital librarian and later as a consumer health librarian in Mumbai, India, during the years 1992-1997, when Medline was on CD ROM and a little later, when Internet access entered the Indian scenario. She discovered that she was good at handling these resources and also that most doctors were quite so successful. She felt that there was a need to reach out to a large audience and not only her library users. In 1997, she started off as an independent consultant to help health professionals use Internet resources. In 1999 she set up “QMed Services” as a consulting organization. She later realized that she not only needed to offer help, but needed to do a lot of advocacy to ensure that correct literature searching, reference management and evidence based health care needed to be taught and actually included in the medical (and allied health) curriculum. She set up “QMed Knowledge Foundation” in 2007, as a “Not for Profit Trust”, so that there would be better acceptance of her recommendations and also her workshops. With the support of five colleagues, she has conducted more than 100 workshops on literature searching / searching for evidence. She has delivered an equal number of short lectures on these topics to promote awareness of the need for such knowledge. She also offers support authors of Systematic Reviews, by coordinating with Trial Search Coordinators, and helps the South Asian Cochrane Network & Centre in her country, with her expertise. Having created web-based resource manuals, her next activity is to create E-Learning modules and also initiate Train the Trainer programs to spread her programs more quickly, in the country. Her goal is to see that literature searching skills will be included in the curriculum, and that strong library support will be available to all health professionals for the provision of evidence based healthcare in the country.